I love you. I love you very much. But you're so big and awesome lately that sometimes I miss that there are certain products available for sale. 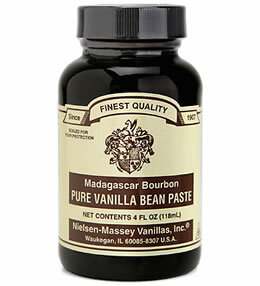 For example, I've used Nielsen-Massey vanillas for years, but I actually had to go INTO A STORE to find out they now make a product called Pure Vanilla Bean Paste, which can be used like an extract, but has vanilla seeds for that speckled "freshly scraped from the bean" look I like in ice cream, custards, and cheesecake. Internet, I need you to tell me these things so I'm not surprised at the store. I'll forgive you this time (since I bought some and will be trying it soon), but in the future, let me know about awesome things. Thanks! OOH! What "store" do you go to stock up on Nielsen-Massey? Williams-Sonoma (I go to the South Coast Plaza location). It's not cheap, but they've got a good selection (the paste, all three vanilla extract varieties, and more). It's a fun place to look around, and they've got some kitchen stuff I just can't find elsewhere. This page contains a single entry by Michael Doss published on April 3, 2009 3:52 PM. Cookie Meet 'n Eat today! was the previous entry in this blog. Flavor Trippin' is the next entry in this blog.